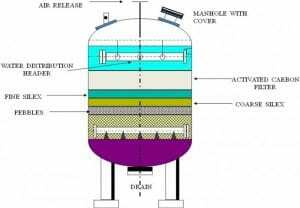 Filtration Theory:For thousands of years filtration has been used to reduce the level of dirt, rust, suspended matter and other impurities from water. This is achieved by passing the dirty input water (influent) through a filter media. As the water passes through the media, the impurities are held in the filter media material. Depending on the impurity impurities and the media, several different physical and chemical mechanisms are active in removing are responsible for the removal of impurities from the water. Some of the equipment used to employ these mechanisms has have changed dramatically over time.The fundamental physical and chemical mechanisms that occur during filtration have become better understood over the years. These advances have allowed water treatment specialists to optimize the removal of impurities from the water. Filtration systems remove particulate matter and, because of the large surface area of filter media, they also can be used to drive chemical reactions that result in the removal of several contaminants. “Adsorption” is one of the most frequently used but least understood terms in discussions of filtration. Adsorption refers to the removal of an impurity from a liquid to the surface of a solid. A water-born, suspended particle adheres to a solid surface when adsorption occurs. Adsorption is the adhesion of atoms, ions, or molecules from a gas, liquid, or solid to a surface. In the case of water filtration, the suspended solid particles present in liquid will adhere to the media solid surface. Adsorption differs from occlusion in that occluded particles are removed from a process flow because they are, where occlusion is the result of particles being too large to pass through a physical restriction in the media. In most cases, adsorbed particles are affected by weak chemical interactions that allow them to adhere to the surface of a solid. Adsorbed particles become attached to the surface of a given media, becoming a film of weakly held part of the solid. The impurity molecules are held within the carbon’s internal pore structure by electrostatic attraction (Van der Waals forces) also known as Chemisorption. In most applications activated carbon removes impurities from fluids, vapours or gas by adsorption., which is a surface phenomenon that results in the accumulation of molecules within the internal pores of an activated carbon. This occurs in pores slightly larger than the molecules that are being adsorbed, which is why it is very important to match the pore size of the activated carbon media with the molecules particles you are trying to adsorb. AES has a vast experience in selecting the right carbon media for you application. Granular Activated Carbon (GAC) is mostly used in fixed filter beds. Some of the important aspects that need to be considered are required contact time, filter vessels sizing, filling and emptying facilities, and safety measures. Further, a crucial consideration regarding GAC refers to possible regeneration, in situ or off site. Normally at very large installations it is possible to do perform in situ regeneration, while in small facilities it is not viable to do regeneration. The most common activated carbon regeneration method is thermal activation. This is performed in three major steps, starting with drying, then heating, and finally residual organic gasification by oxidising gas (steam or Carbon dioxide). Normally replacing the Carbon bed works out cheaper as major Carbon manufacturers are in Europe. It is a myth that Activated Carbon can be regenerated by mere backwash. Backwash only removes the trapped material & reclassifies the Filter Bed. Activated Carbon has a certain life after which it cannot remove impurities & hence needs to be removed replaced. A proper activated carbon has a number of unique characteristics: such as a large internal surface area, dedicated (surface) chemical properties and good accessibility of internal pores. The pore size distribution is highly important for the practical application; the best fit depends on the molecules to be trapped, the phase (gas, liquid) and treatment conditions. The desired pore structure of an activated carbon product is attained by combining the right raw material and activation conditions. The physical and chemical characteristics of an activated carbon can strongly influence its suitability for a given application, and there are a number of different tests that help predict a carbon’s ability to perform. The iodine number test can usually predict effectiveness when very small molecules like Free Chlorine are to be adsorbed. Tannin value and molasses number or molasses decolorizing efficiency are more appropriate in lab test parameters for medium and large-sized molecules or when small molecules are present with larger molecules. In applications where there are is a wide variety of impurities to be removed, the best type of activated carbon is not so easily determined. When impurities range from very small to very large in size, the large molecules often clog up small pores, making them inaccessible to other molecules. In this case, Norit recommends performance testing first (isotherm and pilot column) to identify the best activated carbon for a specific application. As seen earlier, the Activated carbon Filter makes use of Adsorption to remove certain impurities like Free Chlorine, Odour Removal or Organics etc. Activated carbon, also called activated charcoal, activated coal, or carbo activatus, is a form of carbon processed to be riddled with small, low-volume pores that increase the surface area available for adsorption or chemical reactions. Due to its high degree of micro-porosity, just one gram of activated carbon has a surface area in excess of 500 m2, as determined by adsorption isotherms of carbon dioxide gas at room or 0.0 °C temperature. An activation level sufficient for useful application may be attained solely from high surface area; however, further chemical treatment often enhances adsorption properties. Activated carbon is usually derived from charcoal or coconut shell. There are many of applications for Activated Carbon Filters. Only some of them which are most important & common are listed below.